This lacy hotpad is 2 layers thick with a picot edging. 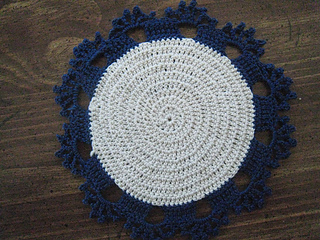 The upper and lower sections of the hotpad are crocheted separately and then joined together in the third-to-last rnd. The lower section is simply dc in MC, worked in a spiral (my spiral dc hotpad pattern). The rest is Irish lace. 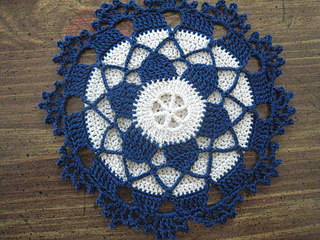 I used leftover size 10 crochet thread in ecru and navy.